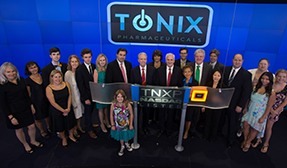 Tonix Pharmaceuticals, a division of Tonix Pharmaceuticals Holding Corp. ("Tonix" or the "Company") is developing innovative prescription medications for challenging disorders of the central nervous system. If you have specific questions about investing, or the products we are developing, please contact us. THIS SITE CONTAINS INFORMATION CONCERNING TONIX AND ITS AFFILIATES THAT MAY BE USEFUL TO OUR CUSTOMERS, SUPPLIERS, EMPLOYEES AND SHAREHOLDERS, AS WELL AS MEMBERS OF THE GENERAL PUBLIC. HOWEVER, BY USING THIS SITE YOU ARE ACCEPTING ALL OF THE TERMS OF THIS DISCLAIMER NOTICE, INCLUDING EXCLUSIONS AND LIMITATIONS OF LIABILITY. IF YOU DO NOT AGREE WITH ANYTHING IN THIS NOTICE YOU SHOULD NOT USE THIS WEBSITE. This page is intended to provide information regarding Tonix Pharmaceuticals. It is not intended to provide information regarding specific treatments and is not intended as a place to report product side effects associated with the use of prescription drugs from any company. Please keep in mind that our authors have knowledge of the topics and fields they write about, but that our content is informational and should not be viewed as professional or medical advice. Always seek the advice of your physician or other qualified health care provider with any questions you may have regarding a medical condition. Reliance on any information on this website is solely at your own risk. Tonix is not liable for any investment decisions by its readers or subscribers. It is strongly recommended that any purchase or sale decision be discussed with a financial adviser, or a broker-dealer, or a member of any financial regulatory bodies. The information contained herein has been provided as an information service only. The accuracy or completeness of the information is not warranted and is only as reliable as the sources from which it was obtained. Investors are cautioned that they may lose all or a portion of their investment in this or any other company. This website contains "forward-looking" statements within the meaning of the Private Securities Litigation Reform Act of 1995. These statements may be identified by the use of forward-looking words such as "anticipate," "believe," "forecast," "estimate" and "intend," among others. These forward-looking statements are based on Tonix's current expectations and actual results could differ materially. There are a number of factors that could cause actual events to differ materially from those indicated by such forward-looking statements. These factors include, but are not limited to, substantial competition; our ability to continue as a going concern; our need for additional financing; uncertainties of patent protection and litigation; uncertainties of government or third party payer reimbursement; limited sales and marketing efforts and dependence upon third parties; and risks related to failure to obtain FDA clearances or approvals and noncompliance with FDA regulations. As with any pharmaceutical under development, there are significant risks in the development, regulatory approval and commercialization of new products. Tonix does not undertake an obligation to update or revise any forward-looking statement. Readers should read the risk factors set forth in Tonix's most recent Annual Report on Form 10-K as filed with the Securities and Exchange Commission as well as subsequent reports filed with the Securities and Exchange Commission. Tonix does not undertake to update its forward-looking statements. This website may contain information on medical and health-related topics. We do not offer personalized medical advice or patient-specific treatment advice. This information is not meant to be a substitute for the advice provided by your own physician or other medical professional. You should not use this information for diagnosing a health problem or disease but should always consult your own physician. You should not rely on this website or any other service offered by or through this website for medical diagnosis or treatment. Tonix is developing innovative prescription medications for challenging disorders of the CNS. The Company targets conditions characterized by significant unmet medical need, inadequate existing treatment options, and high dissatisfaction among both patients and physicians. Tonix is developing new formulations that have been optimized for new therapeutic uses. Its most advanced product candidates, Tonmya for FM and Tonmya for PTSD, are novel dosage formulations of cyclobenzaprine, the active ingredient in two U.S. FDA-approved muscle relaxants. For more information about Clinical Trials, please go to ClinicalTrials.gov and search for "Tonix". The information on this website is intended for use only by stakeholders, patients, health care providers and others in and for the United States. Other countries may have laws, regulatory requirements, and medical practices that differ from those in the United States and may require references to different or additional information. Because laws, regulations, and medical practices applicable in the United States differ from those in other countries, information on this site may not be appropriate for use, and may not and should not be relied upon, outside the United States. 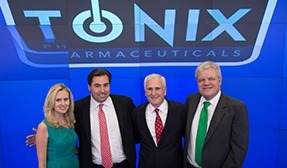 All contents, including text and images, are the property of Tonix Pharmaceuticals Holding Corp (including its divisions and affiliates) (collectively "Tonix"), and may not be downloaded, stored, reposted, modified, distributed or otherwise used except as provided herein without the express written permission of Tonix. We reserve the right to change this site and/or the information on it at any time without notification. Reproduction of any material or information on this site, or of the website itself, is strictly and expressly prohibited. In particular, material or information on this website cannot be distributed, modified, posted on a website or used for public or commercial purposes. No use of any Tonix trademark, trade name, trade dress, logo, service mark, or product as appearing in this website may be made without the prior written authorization of Tonix, except to identify the products or services of Tonix. Nothing contained herein shall confer or be construed as conferring any license or right under any patent, trademark, copyright, or other proprietary right of Tonix or any third party. TONIX CANNOT AND DOES NOT GUARANTEE THE ACCURACY OF SUCH INFORMATION. THIS SITE IS PROVIDED STRICTLY "AS IS, WHERE IS." TONIX MAKES NO REPRESENTATIONS OR WARRANTIES OF ANY KIND OR NATURE WITH RESPECT TO INFORMATION CONTAINED ON THIS WEBSITE, AND HEREBY DISCLAIMS ALL REPRESENTATIONS AND WARRANTIES, WHETHER EXPRESS OR IMPLIED, CREATED BY LAW, CONTRACT OR OTHERWISE, INCLUDING, WITHOUT LIMITATION, ANY WARRANTIES OF MERCHANTABILITY, FITNESS FOR A PARTICULAR PURPOSE, TITLE OR NONINFRINGEMENT. IN NO EVENT SHALL TONIX BE LIABLE FOR ANY DAMAGES OF ANY KIND OR NATURE, INCLUDING, WITHOUT LIMITATION, DIRECT, INDIRECT, SPECIAL (INCLUDING LOSS OF PROFIT) CONSEQUENTIAL OR INCIDENTAL DAMAGES ARISING FROM, OR IN CONNECTION WITH USE OF, INABILITY TO USE, OR ERRORS OR OMISSIONS IN THE CONTENTS OR FUNCTIONS OF THIS WEBSITE, EVEN IF TONIX OR AN AUTHORIZED REPRESENTATIVE THEREOF HAS BEEN ADVISED OF THE POSSIBILITY OF SUCH DAMAGES. IF YOUR USE OF THE MATERIALS, INFORMATION OR SERVICES FROM THIS WEBSITE RESULTS IN THE NEED FOR SERVICING, REPAIR OR CORRECTION OF EQUIPMENT OR DATA, YOU ASSUME ALL COSTS THEREOF. From time to time we may provide links to other websites, which are maintained by third parties over whom Tonix has no control. These links are provided for your convenience only and the presence of such links does not mean that Tonix endorses, recommends or represents them in any way. Tonix does not control, and is not responsible for, any such sites or their content. Tonix disclaims all warranties, expressed or implied, as to the accuracy, legality, reliability or validity of any content of such sites. Certain areas of this website enable you to submit emails, or subscribe to company information newsletters. Tonix does not endorse, and specifically disclaims, any responsibility or liability for any content in any such submission. You may not post, submit or transmit any unlawful, threatening, libelous, defamatory, obscene, indecent, inflammatory, pornographic or profane material or any material that could constitute or encourage conduct that would be considered a criminal offense, give rise to civil liability or otherwise violate any law. You are prohibited from posting, submitting or transmitting any information which (i) infringes or may infringe any right of another, including privacy or publicity, (ii) is protected by copyright, trademark or other proprietary right, unless with the express written permission of its owner, or (iii) contains a virus, bug, worm or other harmful content. You shall be solely liable for any damage resulting from any post, submission or transmission you make. While visiting or using this website, you agree not to frame, repackage, or otherwise use any portion of this website to create derivative works without the express permission of Tonix. In addition, no graphics available from this website are to be used separate from accompanying text. All content distributed through Tonix social media channels are intended for U.S. residents only. Whenever a third party posts content to our social media properties, this information remains the responsibility of the party submitting the content and does not represent Tonix viewpoints. Content posted on Tonix social media channels should not be considered a recommendation of personalized advice.